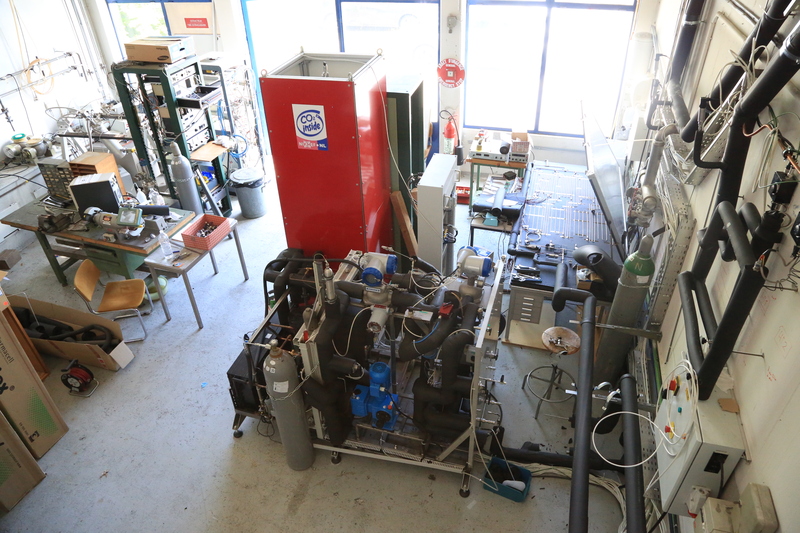 The CORA (CO2 Research Apparatus) cooling system is built to serve as a CO2 based cooling test bench for the LHC tracker upgrade. This system was the first one build at CERN to test the feasibility of employing a CO2 on future CMS and ATLAS detectors. CORA uses the principle of Two-Phase Accumulator Controlled Loop (2PACL) used successfully on the AMS and LHCb detectors. The test bench has been designed to be capable of accommodating large volume experiments while still maintaining flexibility. It features a control system which is serving as a platform on which to develop future LHC detector cooling control systems. It is designed to cool any test structure with evaporating CO2 at a given pressure. Cooling system allows for continuous operation at adjustable evaporation temperature inside the testing element in range of -400C to +200C with cooling power of up to 2 kW. CORA cooling station contains: cooling plant, primary R404a chiller, accumulator unit and 3 distribution branches; the Small Experiment line (for low mass flow rates, up to 5 g/s), the Large Experiment line (higher mass flow rates) and the bypass line, which is used either in the absence of any experiment, or in conjunction with the small experiment line. The bypass line uses a dummy heater for putting enough heat-load on the chiller to keep it running when the small experiment line is being used. Within already several years of operation aside from being used internally within CMS and ATLAS, it has also been used by researchers from SLAC, KEKb – Belle2 and also by the Cryogenics department at CERN to develop heat transfer coefficient correlations. It’s flexibility in accommodating different sized experiments, the ease of use of the cooling system and the problem-free nature of its operation has made its applications more widespread than was originally envisioned.